$14.99 to $49.99 & FREE Shipping on orders over $59 $35. 2 Liter amber flip top growlers. Features a wide, pot-bellied shape. Finger carrying hole and wide flip top lid. Swing tops are shipped separately and must be assembled before use. Maybe the only time you hear, "Man, I love your pot belly". Sold individually or in a case of 6. Hard to find anywhere and the price is low. Because I love to carry beer around! I have a couple of growlers already and they work fabulously for sealing and resealing while holding the pressurized contents. Christmas gift for my favorite son. Ease of sealing the lid. 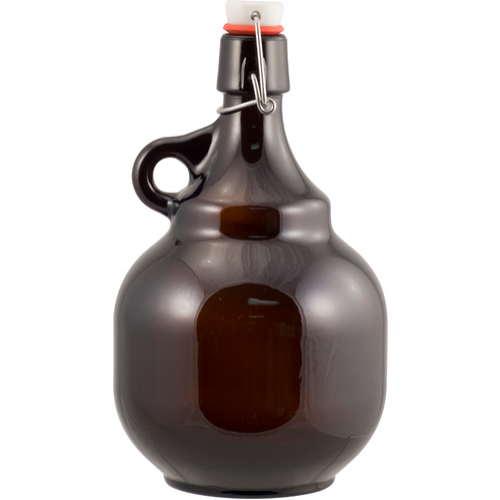 The Palla 2 liter growlers are a great product, and at a great price too! Each growler hold 4 pints of beer, and is simply and solidly made! I plan on ordering another dozen soon! Saves on cleaning and bottling time too!